I love my double oven and I also love my counter mixer. These two tools make it difficult for me to imagine life during the colonial period. 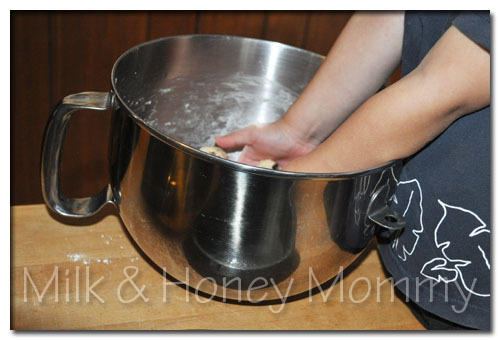 Although I do knead some of my bread by hand, my mixer comes in handy quite often and saves me from tired hands and worn out arms. Hmm. If your curiosity has got a hold on you, then you could always head to Massachusetts and spend a weekend there. For me and for now, I am satisfied with just baking a recipe that is reflective of that period. My oven and mixer both need me here, in 2010. The Hartford Election cake was one of many recipes included in American Cookery, which was the first published American cookbook in 1796. It was a 90lb cake, but don’t worry this recipe doesn’t cook up that way. This New England dessert was served each spring, at recess, during an all-day session of meetings to elect local officials. You can probably find several different version of this recipe after doing an Internet search, but this is the one that is included in the book series we used for studying the state of Connecticut. Yeast? Cake? Does not compute, but I followed the directions anyway. With only one package of yeast, I figured, what damage could really be done? Lily is a mixer and shaker and that is in and outside of the kitchen. I’m going to have to watch that girl. This recipe is quite easy to make. 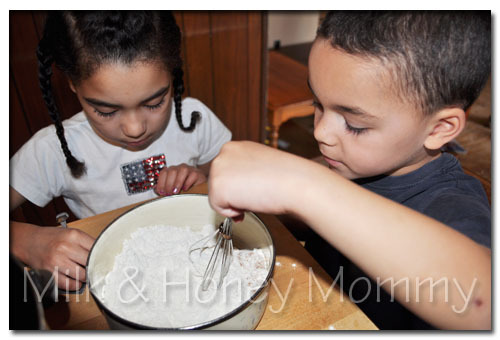 When cooking with children, that doesn’t always matter because the real challenge is not finding an easy recipe for all to make, but instead making sure that each child has a job to do every 1 1/2 minutes. That interval could vary depending upon the age group of children, but in our house, it fits about right. After River poured in the flour, I lost him for a few minutes because “his turn was over.” He wandered away somewhere in the house. Lily used a steady hand and meticulously added the nutmeg. 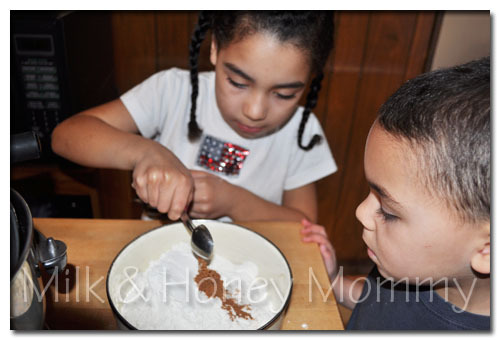 She started making a picture, but the recipe only called for two teaspoons. Canyon had been holding onto this whisk ever since he pulled it out of the drawer. 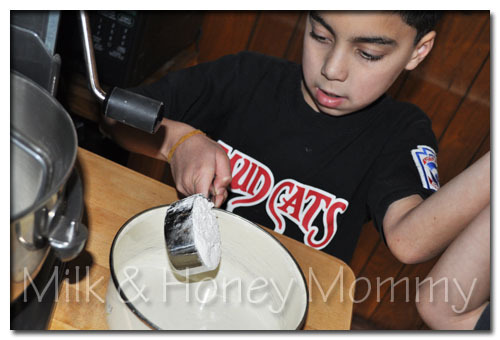 He was determined to use it and he managed to keep most of the flour and nutmeg in the bowl. I found River and was able to coax him back into the kitchen to add the butter. He really does enjoy cooking, but we do better earlier in the day. When cooking in groups, teamwork is really what it is all about. 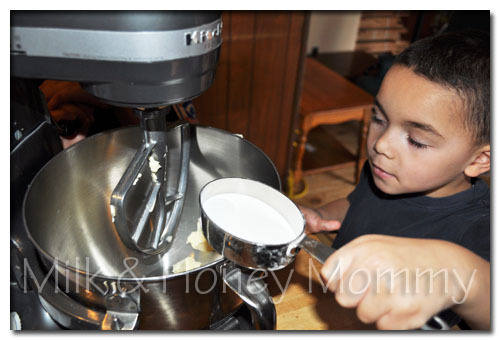 Everyone stayed in the kitchen and they waited patiently for their turn while Lily added the sugar. We were getting closer to adding the messy (liquids) stuff. 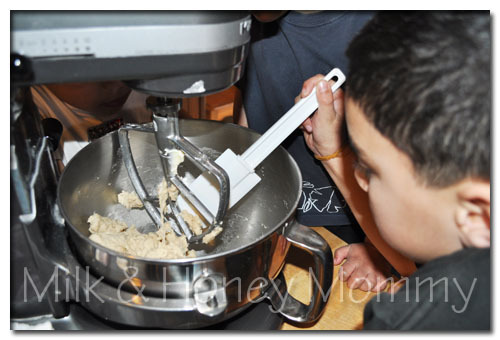 Plus, everyone wanted to turn on the mixer. Argh! Who was to be first? Although I had quite a few egg-cracking volunteers, I cracked them myself before they were added. On this cooking venture, I wanted clean-up to go as smoothly as possible. All the while River was adding the yeast and water mixture, I kept wondering how this was going to be a cake and not a bread. I even cut the recipe in half because the original ingredient of 4 1/2 cups of flour along with yeast gave me a little bit of concern. 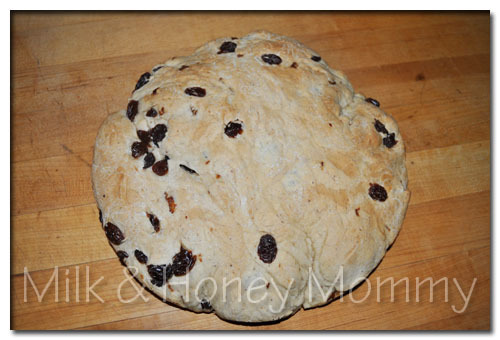 I’ve seen what yeast does to flour when I make our daily bread. 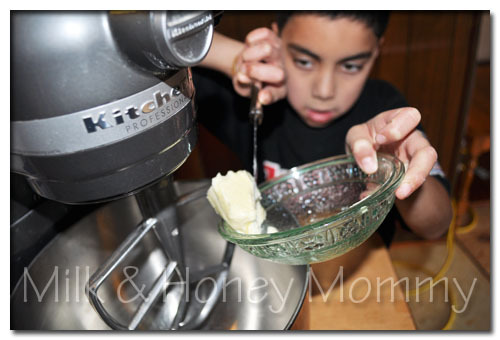 Cut down, reduce, or eliminate tantrums in the kitchen by letting the littlest helper have his way. We experienced none of the aforementioned because Canyon got a turn starting the mixer. 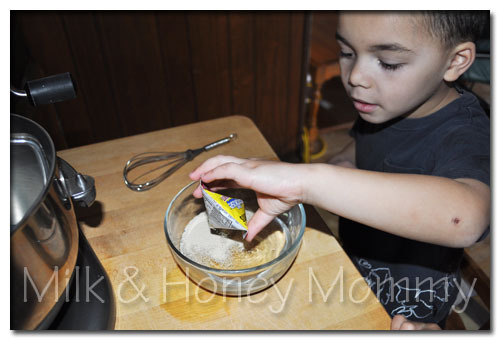 We continued adding dry ingredients to the water and yeast mixture. 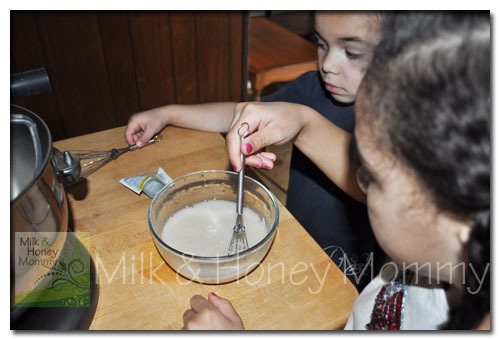 Before the mixture became too stiff, we added the vanilla. River moved in and handled the “dirty” work of scraping down the blade. It was a little bit gooey, but nothing “the hook” couldn’t handle. This little attachment has made my life so much easier. If you don’t have one, then buy a mixer that does. It is totally worth it. 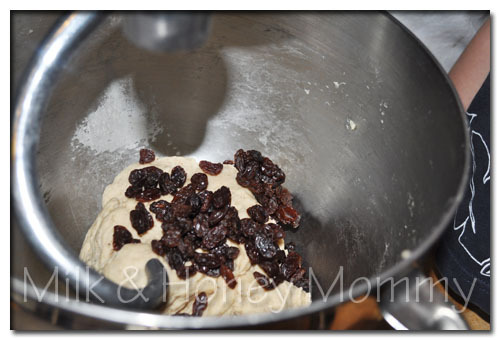 Next, we tossed in the raisins and mixed until they were well embedded into the dough. This is one reason to always wash any grubby little hands before they start cooking. You never know when one, or more, may touch the food. For your information, we run a clean kitchen and all hands were washed before they started cooking. You may have noticed that I have been using the term dough instead of batter, because that is what we had. 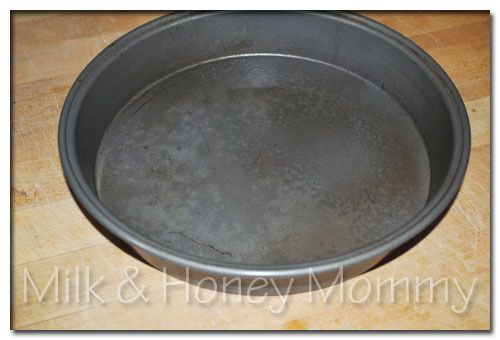 It was slightly stiff, which was fine, so we mashed it into the pan and shaped around the edges. If you decide to cut the recipe in half as I did, then let the dough rise for a few hours. We didn’t have enough to shape around the entire pan. After it rose, there was plenty. We mashed and pressed into the pan again, and set it aside to rise for another few hours. 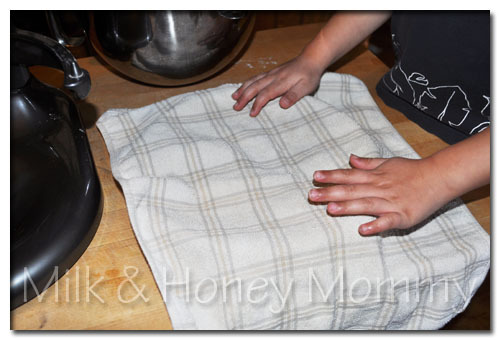 Cover the dough with a dry towel. Once the dough rose, we baked it for about 35 minutes and this beauty is what we got. Like I have been saying all along, it is more like a bread than a cake. Srumptious! We now have a new breakfast bread. 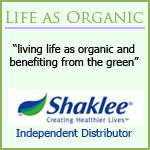 It is also great for snacking on throughout the day. 1. Add one package of yeast to water and mix well until the yeast dissolves. 2. 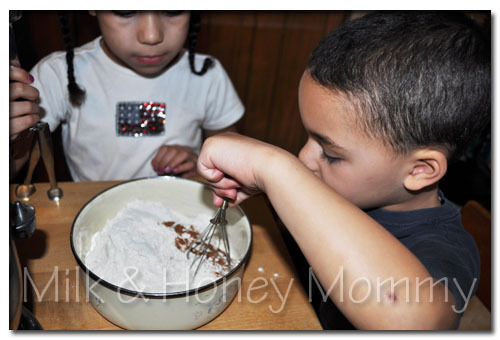 Sift together the flour and nutmeg and set aside. 3. 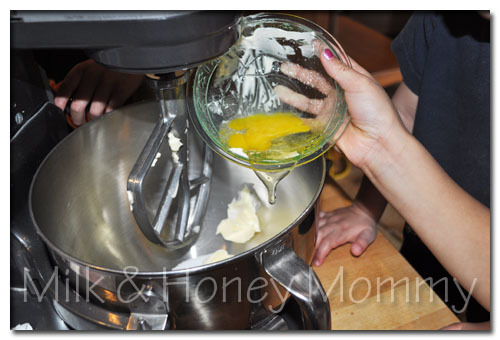 In a medium mixing bowl, add the butter and cream with the sugar. 6. 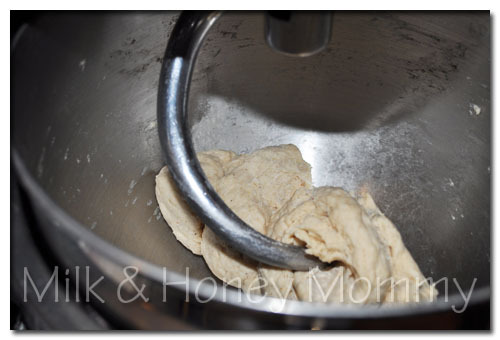 Add the yeast and water mixture and blend well with other ingredients. 7. 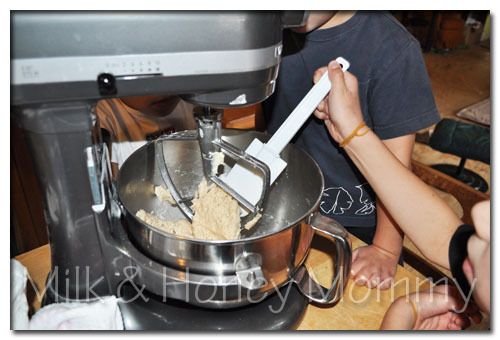 Add dry mixture to mixing bowl and blend. 8. 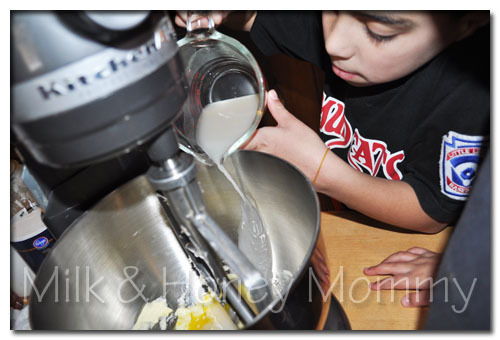 Add the vanilla before the mixture gets too stiff. 9. 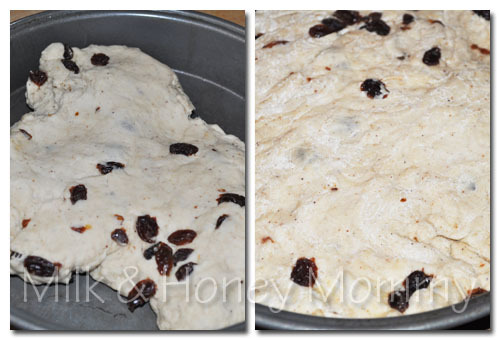 Once mixture is stiff, add the raisins and knead for another five minutes. 10. 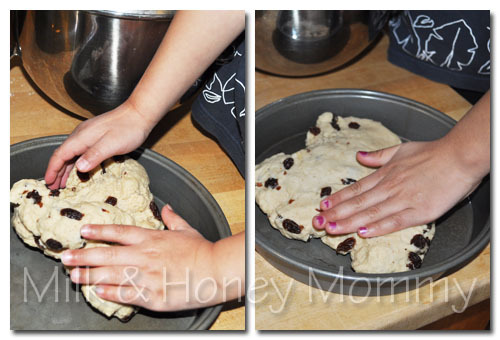 Shape the dough into a round cake pan, cover with a towel, and allow it to rise for about two hours. 11. About ten minutes before putting it in the oven, preheat the oven to 350 degrees. 12. Bake cake for about 35 minutes periodically checking to not burn. 13. Optional: While cooling on a wire rack, sprinkle with confectioners’ sugar. 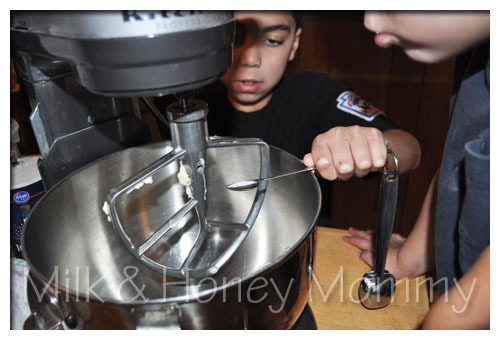 I love it when the kids help me cook. Your three look like they enjoy cooking with you too. The bread/cake looks good. I have not made bread in a while. I just bought some yeast maybe we will try this one. 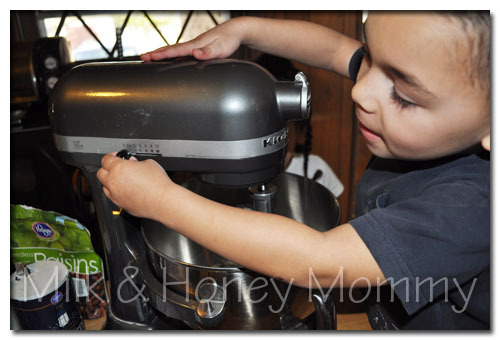 Unfortunately I do not have a “super mixer” like yours, just a baby one. Hopefully that will do. You are so unbelievably talented in the kitchen, I just love your recipes and making everything from scratch. I feel like such a lazy cook compared to you. 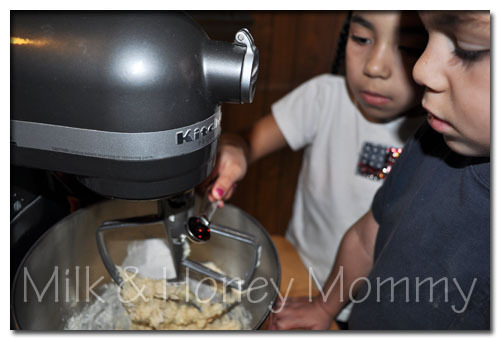 The kitchen is the one place I love having my kiddos help out. 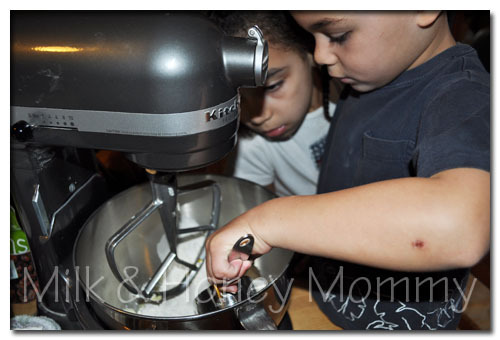 They always take turns adding ingredients much like your little ones did. 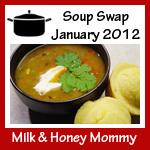 Hi there:) I’m a new follower to your blog and couldn’t help but check out your cooking posts! 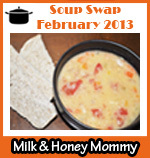 I’d love to try this recipe at home as well:)have a blessed weekend! My girls love to help me in the kitchen! This can be such a special time with our kids. Such sweet pics of your kiddos.